Saint Patrick’s Middle School provides a faith-filled educational experience designed to develop and nurture the whole person. The middle school faculty members are passionate about what they do and understand the needs of both the students and the parents as they transition into middle school and prepare for high school. Teachers work hard to bring out the best in each student, while differentiating instruction to address individual student’s ability and learning style. 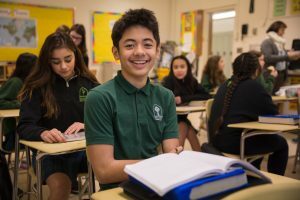 Middle school students are academically prepared for high school through rigorous and relevant curricula, which are based on Common Core Standards developed by the State of Washington and Archdiocesan standards. St. Pat’s develops the students’ sense of inquiry, creativity and individuality, and provides ample opportunity for collaborative work. Faith is at the heart of all that we do at Saint Patrick School. Students attend mass, prayer services, class retreats, and more. Saint Patrick’s Middle School students build their relationships with God and share their faith with their family, school and communities. St. Pat’s students understand the importance of servant leadership. They share their time, talents, and treasure serving their community in a variety of ways including: feeding the homeless (Keep ‘em Warm and Fed), assisting children with autism (TopSoccer), and serving their school and parish community (Safety Patrol and Altar Serving). Graduates of Saint Patrick School are well-rounded, intelligent young men and women who are prepared to be faith-filled stewards of the world community.